Stationery, Decor & Gifts - Designed By You! The WeddingPaperie service is based on the idea that we are all different, and there is a designer within each of us. WeddingPaperie provides the tools and inspiration, and lets you do the rest. Wedding Paperie is a branch on the Luxe Cards family tree. With the same high quality standards and exceptional level of customer service that Luxe Cards offers, Wedding Paperie was created with two basic principles in mind: Give customers the ability to customize their wedding invitations and stationery and provide personalized customer care. We believe those two elements help us to provide you with stylish, high quality wedding stationery that you will love. The Wedding Paperie service is based on the idea that we are all different, and there is a designer within each of us. We know that our customers love to create their own custom wedding invitations - we see the creative ideas every day. We also know every couple is unique and deserves equally unique wedding stationery to showcase their personality and style. Wedding Paperie provides you with inspiration, tools, and access to our design team for unparalleled customization options. We are proud to showcase our beautiful wedding designs and can’t wait for you to choose the one that you wish to customize. You can easily pick one; add your details and you are done. Or, change it up a bit by moving things around and adding special touches. However you go about designing your wedding invitations and wedding stationery, we just want you to have exactly what you envisioned. Customer satisfaction is always our number one priority. Our customer service team handles every phone call and email with the same level of care. We see the person and event behind every order. 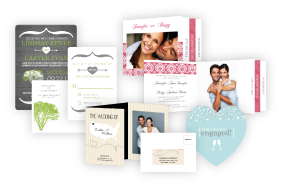 It all comes down to the fact that we want you to love your invitations and cards. 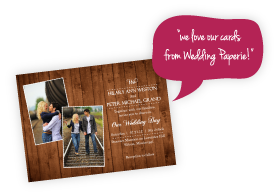 We appreciate you giving Wedding Paperie the chance to show you how great our service is. We understand it's not just another day; it’s your wedding! A most momentous occasion and you deserve the best! We are a Seattle based company, and still small in the big scheme of things, but over the last few years we have improved and grown a lot. We appreciate each and every one of our customers. We are constantly improving our service and we are always working to create additions to our site that make it even better. With the help of you, our customers, we will continue just that. From the entire Wedding Paperie team, we offer our many thanks. Thank you for your wonderful reviews, your constructive feedback and your word of mouth referrals to your friends and family. Thank you for choosing Wedding Paperie. We want you to know we appreciate you and we are so happy to be a part of making your wedding beautiful and stylish.